A family-run firm is fast blossoming into a UK industry leader - after crowning their first full year of operating with an invite to share in Meghan Markle and Prince Harry's Royal wedding. 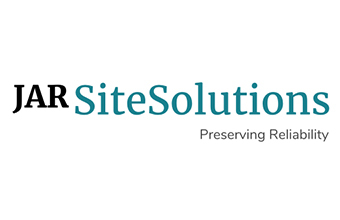 JAR Site Solutions was formed by husband and wife team Jon and Alisha Riches in August 2017, drawing on Jon's 20 year experience in security and construction projects. But 2018 beat all their expectations as they ended the year by forming an official business partnership with their local Premier League football club, Crystal Palace FC. And they were proud to be asked to assist officers on 19th May with a 50-plus strong security team supporting Thames Valley Police near WindsorCastle. After setting up the previous autumn and joined on the exciting journey by many loyal clients, JAR Site Solutions started 2018 working at the London Stadium on a West Ham match, along with concerts at The O2 and a Private Boat party in Central London. Founder Jon Riches, 46, said: "From there, we never looked back. "Events came in thick and fast throughout the year, with the highlight being stood in Windsor with over 50 staff, supporting the Police at Prince Harry's Wedding. "It was amazing and we as a company felt honoured to be there and help ensure a safe and enjoyable day. "It was a hugely proud moment for all of us and experience I know my staff will never forget." However, the firm have also been thrilled to work on many smaller events across London including the 'Jerk Cookout' in Croydon, their local town. That project typified the close working, idea-sharing relationship the firm always encourage with all their clients - big or small. Explaining the process on that job, Jon revealed: "Work started early, with meetings with the organiser to ensure we completely understood what he wanted us to achieve. "Risk assessments and an event safety plan quickly followed, along with various SAG (Safety Advisory Group) Meetings. "Eventually at the end of July the eagerly awaited event day came - but typical for the UK at the height of a scorching summer the heavens opened! "As we plan for every eventuality this failed to deter our security team who clicked into action. "We deployed several SIA (Security Industry Authority) staff and safety stewards on gates, checking tickets, bags searching etc, along with a five-man response team patrolling the inside of the event footprint. "We are delighted to say the event was a huge success for the client and hats off to them for creating a wonderful day, and our staff for ensuring a friendly and safe atmosphere." Both Jon and wife Alisha are licensed security operatives themselves, so love working on the ground leading their teams on many of their jobs. Jon added: "We ended the year having over 200 staff managing partygoers at the London Eye seeing in New Year at the live, televised firework and music event. "It was a great way to end our first full year and felt fitting that of course we were both there on the ground as usual, working alongside our crews. "We can't wait to expand the business further and explore new opportunities with our amazing clients in 2019!" Event Promotion: Fireworks poster or Facebook post? Find out whether a Facebook post outperforms a printed poster for community events with the latest Fireworks event report from TicketSource. Over 60,000 customers were quizzed on their purchase habits for 160 Fireworks Displays across the UK. 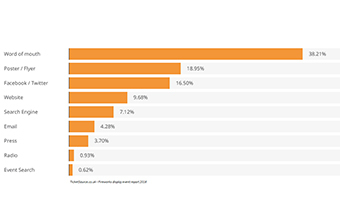 The report published by TicketSource.co.uk includes stats for online, in-house and telephone sales made across the UK. While marketing predictions for any single event might be different, the report has sampled events both large and small for a broad industry analysis. The report predicts the Friday 5th October to be the best time to start marketing efforts - with over 50% of sales last year being done before 1st November and 92% of all sales reported being completed online. But should event promoters focus on Facebook posts or Flyers/posters? Posters and flyers are still a heavy influencer but Facebook/Twitter are catching up fast. With the use of mobile devices and social networks growing, it's important that all event organisers straddle the trend: With one foot in the digital world and the other in reality. But the real surprise is the number of people that still rely on friends/family to research events - with a huge 38% of purchasers referred by people they knew. That's more than posters & posts put together! TicketSource is the UK's leading online event ticketing company for local and community events. They're ranked as one fastest growing companies in Wales for 2016 and 2017. TicketSource.co.uk is also featured in Amazon.com's top 100k sites on the worldwide web. 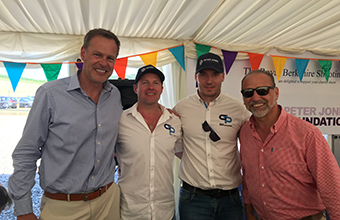 Leading marquee and gazebo designer and manufacturer Gala Tent was proud to sponsor the Peter Jones Foundation Enterprise Shoot Challenge recently, a fundraiser which raised Â£157k for Enterprise Education for young people. Gala Tent's branding and print division Gala Graphics designed and printed gazebos, pop up banners and feather flags for the event, which was held at The Royal Berkshire Shooting School in Reading and attended by over 100 delegates. The event included a clay pigeon shooting competition, followed by champagne reception and auction of a number of 'money can't buy' gifts to raise funds for the charity. Gala Tent has been involved with the Peter Jones Foundation since 2011 when the National Enterprise Academy was established at Sheffield college, offering 16-18 year olds the opportunity to undertake a one year BTEC Diploma in Enterprise and Entrepreneurship, as part of the Peter Jones Enterprise Academy. Over the past seven years, Gala Tent has set challenges for students to create a new marquee and gazebo product range and Jason Mace gave them the benefit of mentoring and coaching to encourage their entrepreneurial skills. Gala Tent, based in South Yorkshire, is the UK's largest supplier of marquees and gazebos, exporting across Europe and to the US. The company designs and manufactures a wide variety of solutions to suit both large and more compact garden and patio areas. All products are quick and simple to erect and are designed to withstand the worst of the British weather, with selected products tested to withstand up to 80 mph winds. Founded in 1999, Gala Tent now sells over 15,000 tents and marquees each year, along with around 90,000 event accessories and furniture products in the UK. Gala Tent is a preferred supplier for organisations including the military, NHS, the South Yorkshire Fire & Rescue Service, South Yorkshire Police Service, St John's Ambulance and AA, as well as to thousands of homeowners nationally. For more details, visit the website www.galatent.co.uk or call 01709 913990. Borde Hill Garden, Haywards Heath on Saturday 7th and Sunday 8th July 2018. Set to become a highlight of the UK festival calendar, with tickets starting at just Â£40 per adult (booking fees apply), this year's headline acts are UB40 (plus support ASWAD) and The Gipsy Kings featuring Nicolas Reyes & Tonnino Baliardo, who will be performing at Borde Hill Garden on Saturday 7th and Sunday 8th July respectively, with further special guests to be confirmed in due course. Bringing world-class acts to spectacular historical settings, A Boundless Summer is sure to give attendees a memorable and unique experience. Borde Hill is a beautiful Grade II* English Heritage garden set in 200 acres of parkland with magnificent views across the Ouse Valley viaduct. Created by Colonel Stephenson Robert Clarke from seeds gathered by the Great Plant Hunters of the early 1900s, the Edwardian Garden it is renowned for its rare shrubs and champion trees. The Garden includes distinctive living 'rooms', each with its own unique style, from secret, sub-tropical dells to the sophisticated Rose and Italian gardens. 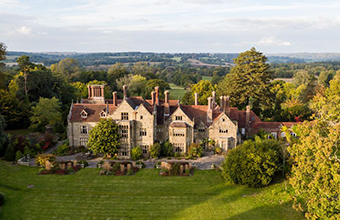 Nestled at the heart of the 35-acre garden and woodland is the Elizabethan Mansion House. The concerts will take place in the beautiful parkland setting in front of the lakes and with the backdrop of the Elizabethan Mansion House. There will be a good quality range of catering and refreshments available to purchase on-site, and guests are able to pre-order a picnic hamper for collection on the evening of the show, to enjoy in the grounds. Attendees will also be able to bring in small camping chairs and picnic blankets from which to enjoy the concerts. Boundless is a club dedicated to civil-service and public-sector workers - active and retired - looking to get more out of life for less. Members pay a small fee per year, and are given access to exclusive days out, holidays, ideas and offers. A Boundless Summer, the company's inaugural festival, is being opened up to the general public, who, for the first time, also have the option to join Boundless upon buying tickets, giving them access to the exclusive deals on offer year-round. Legendary reggae and pop band, UB40 will be performing on Saturday 7th July, plus support ASWAD. UB40 are celebrating 40 years in the business along with the release of a new album in conjunction with PledgeMusic. The band has had more than 50 singles in the UK Singles Chart, and has also achieved considerable international success. They have been nominated for the Grammy Award for Best Reggae Album four times, and in 1984 were nominated for the Brit Award for Best British Group. UB40 have sold over 100 million records worldwide. The ethnic make-up of the band's line-up is diverse, with musicians of English, Irish, Jamaican, Scottish and Yemeni parentage. The Gipsy Kings featuring Nicolas Reyes & Tonnino Baliardo will take to the stage on Sunday 8th July. It has been twenty-five years since they captured the world's imagination with their self-titled debut albumâ€”a record that became a genuine phenomenon, certified gold and platinum around the globe, introducing millions of listeners to a unique, irresistible blend of traditional flamenco styles with Western pop and Latin rhythms. Since then, the band has sold almost twenty million albums, all the while retaining the same line-up of virtuoso musicians. A Boundless Summer will also be hosted at Bowood House, Wiltshire, with Jools Holland & his Rhythm & Blues Orchestra and Katherine Jenkins with The National Symphony Orchestra performing at the venue on Saturday 21st July and Sunday 22nd July respectively. 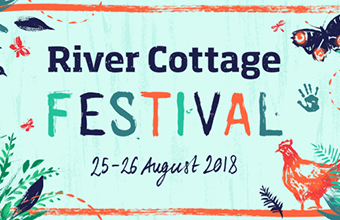 The River Cottage Festival is back! With the success of the last two years behind us we're bringing back an experience for all the family where you can make some wonderful memories whilst kicking back in the sunshine and unwind in our beautiful Devon countryside. We've a jam-packed line up of music, masterclasses and all the festival fun you could wish for! It wouldn't be River Cottage if we didn't have some delectable delights on offer and this year is no different. Take yourselves off for a stroll around the farm and sample some of the best street food the South West has to offer. Or book yourself in to one of our Farm House Feasts and have a deliciously made lunch created by our talented chefs from the wonderful produce we grow on the farm. For those wanting to immerse themselves in the River Cottage life we've got our famous foraging tours with the infamous John Wright, you could dip your toes into a masterclass or two or simply take a deep breath and bring out your inner yogi with a carefully crafted relaxation sessions. The children will be kept busy with lots of activities pottery and felting workshops, bushcraft, the mud kitchen and forest school activities! And whilst they are having fun you can sit back with one of our ciders or a cocktail and enjoy the beautiful scenes we have to offer here on the farm. The garden demo stage will be a flurry of familiar faces, this year we are excited to announce Bake Off's Prue Leigh in conversation with Hugh aswell as our very own Steve Lamb as host introducing other well respected talkers. And not forgetting the music! Your soundtrack to the weekend includes mellow acoustic artists to help you chill out and soak up the magical River Cottage atmosphere and some lively foot-stomping bands to really get the party started once the sun sets (make sure you buy Gig Night tickets). Finally, as the day comes to end you can stroll across the fields in the moonlight to the campsite where you can choose to stay in either your own tent or why not book a gorgeous Honeybell's tent for a little bit of luxury? The Festival will be taking place on Saturday 25th and Sunday 26th August 2018, and under 16's can come for free. 10,000 users sign up to Grafter! Grafter is a new free digital solution for business to rapidly engage project, short term and seasonal workers. 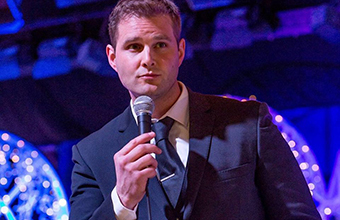 The concept was conceived by Tom Cape and co-founded with Richard Knight in June 2017. Following a 156% overfunding raise in October 2017, Grafter has already attracted over 10,000 registered users. With a range of skills and experience in technology, digital startups, business development and finance, the Founders also share a passion for building and property development which in turn helped shape their insights for the Grafter business. Tom Cape recognized the opportunity when he tried to find people to shift concrete on a small building project. To his great frustration, he couldn't find anybody to fulfill the job - despite knowing there were local people out there. A similar experience was experienced by Richard so they resolved to tackle the problem together. Through further research, it became apparent that a large number of business sectors including events, the leisure sector and building required a faster route to find non-specialist workers. Coupled with the fact that flexible working has become a positive choice for millions of people - from millenials to the retired - the Grafter business was born. Grafter is designed for businesses seeking project, short term of seasonal workers in leisure and events. farming, landscaping, delivery, warehousing and factory/light industry and self-employed workers seeking flexible or short term work that doesn't demand qualified skills or past experience. As Tom Cape explains, Grafter is fit for the demanding needs of business and workers both now and the future. 'We recognise the way people want to work and the type of work available is changing rapidly. Grafter is the first free digital service that engages all types of flexible workers with local business in just a few steps - making the process of finding work and workers, swift, cost-effective and trustworthy too'. Whether its labourers seeking their next building project, students looking for holiday income or older workers searching for gardening or driving work, Grafter offers a simple sign up process. 'Grafters' are able to upload their profiles detailing who they are, where they are located and what they are able to do. In the case of businesses seeking 'grafters' - the service is completely free for businesses to find and engage workers. Grafter also offers a managed service including additional value-add services such as tracked messaging, digital contracting, reminder emails and a cashless payment system. At the payment stage, Grafter charges the business a usage fee of 5% plus VAT. In a fast growing culture of flexible working, Grafter is committed to supporting good practice and fair work. The service only allows jobs to be posted and priced at or above the minimum wage. The Grafter team is growing - focusing efforts on the brand and its global reach through digital marketing, PR, social media, events, partnerships and direct to market tactics. As true digital disrupters of the traditional employment marketplace, Grafter plans to amplify its platform in the future making the website a destination for additional services such as tax administration, accounting and for charities to find volunteer workers. Grafter is available at www.Grafternow.com and the Grafter app is available on iOS and Google Play. There are just a few days to go until the Excursionsâ„¢ 2018 exhibition takes place at Alexandra Palace in North London on Saturday, 27th January (10.30am-4pm). Nearly 250 exhibitors from across the UK and near Europe are ready and waiting to meet you - have you booked your free entry ticket? You can still register online until the show start time, just complete your details and download your digital e-ticket. Alternatively, come along on the day and register at the gate. On arrival (10.15-10.45am) you will be welcomed in Palm Court with a taster of the much acclaimed tribute acts from the Matinee Shows, which are produced by Groups Direct in association with James R Hearn. The artists will also be performing throughout the day inside the show with tributes to the likes of Elton John, Freddie Mercury, Michael Bublè and Dolly Parton and Kenny Rogers. If you haven't yet booked your free coach transfer, there is still time to reserve a seat online, but hurry as the final date for booking is 22nd January and some coaches are already full. For visitors making their own way by train, a free shuttle service will run from Alexandra Palace main line and Wood Green Underground stations from 10am until 4pm. The W3 bus also picks up from both stations and drops off at Alexandra Palace. Organised by Tourism South East, Excursionsâ„¢ is the No.1 stop for inspiration, ideas and itineraries for days out and short breaks for groups and coach tour operators. For more details and to book a place on a transfer coach contact the ExcursionsTM team on Tel: 023 8062 5516 or visit www.excursionsshow.com. Whilst biometric access control is now seen as the technology of choice for many business sectors, its take-up by domestic and SME customers has been limited through the perception that the technology was more cost-effective for larger installations where the added value of time and attendance data acquisition could be factored into the decision to purchase. However, a new integration between ievo Ltd, the Newcastle-based manufacturer of CPNI-approved, innovative biometric fingerprint readers, and Texecom, Europe's largest independent security alarm specialist, has now made the technology more accessible to the domestic and smaller SME markets. ievo biometric fingerprint readers can now be integrated with Texecom's Premier Elite Series of control panel systems, providing a single comprehensive system architecture and peripheral range of devices managed by biometric control. 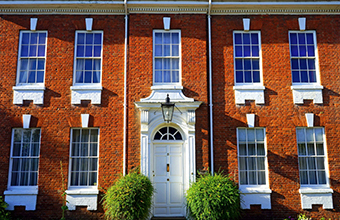 Intruder alarm systems can be activated and disarmed by reading a registered fingerprint and the system can be extended to relay information used for a single door access control entry point to further functionality. For more information on ievo biometric systems please visit www.ievoreader.com. Your event transport solutions made easy with Event Connect. 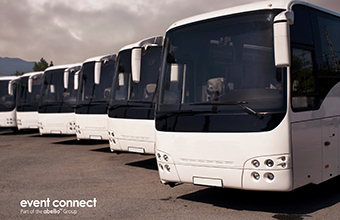 With a UK wide network of road transport partners and vehicles ranging from coaches, luxury minibuses and executive cars, Event Connect will work as an extension of your team providing a full service, tailored transport solution to suit both you and your customers. No matter what type of event you're planning, we've got project planners with the expertise and experience to match and we'll assign you a dedicated project team with the right skills to deliver a transport plan, which offers efficiency and reliability. With years of experience in event transport and the additional support from our 24 hour control room, our regionally tailored service will ensure you are in safe hands, leaving you free to focus on planning the rest of your event. Tobacco Dock, The City's iconic conference and events venue, is also home to a stunning complex of offices, meeting room suites and semi-private workspaces. 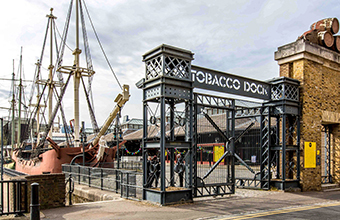 TDVL, operators of Tobacco Dock, are now aiming to attract a range of businesses in the events space - including suppliers, event tech innovators, production companies, hospitality specialists and ticketing businesses - to base themselves in characterfulÂ offices at the venue. Patrick Donovan, Managing Director of TDVL, says "Over the last decade we've seen a trend towards clustering where your clients are. FinTech in Canary Wharf, creative industries in Shoreditch and Soho etc. It seems to make sense for events professionals, SMEs and specialist suppliers to be co-located with one of the capital's busiest events hubs. We can't promise that our clients will become their customers, but it makes sense to be on site and in a position to showcase your ideas in a venue where more than half a million visitors a year, and some of the world's biggest brands, are passing through". The Dock offers private and semi-private offices for businesses from 2 to 30 people and, thanks to the recent explosion of development in the Wapping and Shadwell area, as well as new facilities on site like Dock St Cafe and the super-cool Skylight rooftop bar and lawn-club, the neighbourhood is really coming to life. New residential and retail projects are springing up next-door at London Docks & St Katharine Docks and Thomas More Square also boasts a range of new bars and cafes as well as access to tube and overground networks. Donovan is convinced about the attractions of the kind of office facilities that he has created at The Dock 'Who wants the hassle of long-term fully repairing leases and all the investment required for reception, security, print room, IT, super fast wi-fi and other facilities? By packaging all that up and being able to offer a business of say 6 people a smart, fully serviced office for less than Â£20k pa including rent, rates and all service charges - we think The Dock will make the perfect home for small, but fast growing events industry enterprises'.